Another busy year has so quickly flown by here at St. Joseph’s as we finish off in a blaze of glorious sunshine. For myself I am acutely aware of the fleeting nature of time when I look back on my 40 years of having the privilege of being part of this great school community of St. Joseph’s. I am immensely grateful in particular for the privilege of being the Principal in the final years of my career and the tremendous support I have had from our staff, Board of Management, Parent’s Council, parents, guardians and of course the pupils. My heartfelt thanks and appreciation to all. The pupils of this school are boys of whom this school community can be very proud. Wherever they have gone, be it on tours; visits to library, Arts Centre events, Highlanes Gallery, history walks, sports events etc., compliments on their behaviour and attitude has been frequent and genuine. Molaim sibh a bhuachailli. A special farewell is highly appropriate for our outgoing Sixth Class. They have been a great example to their fellow pupils in their friendly interaction with each other and their very positive cooperation with their teachers making it a really satisfying year for all. We wish them the very best of futures. A particular word of thanks also from myself for their parting gift to me of the “J Clay 40 “ Galway jersey! Much appreciated. Throughout the year 2017/2018, school activities have been enthusiastically embraced by our pupils. Cooking/baking, gymnastics, Viking visit, Transition programmes, sporting activities –especially gaelic football, soccer, table-tennis, athletics – Lego club, Chess Club, Homework clubs, Mindfulness activities, Blessed Sacrament adoration, Sacrament of Confirmation, Drogheda library Book Club, Junior Entrepreneur Programme, Green Schools Tidy Towns initiative, Ukelele classes, Singing Club, Parent and child cooking/ guitar classes, Cas Amhráin Tg4, Rith 2018, and the list goes on! In my teaching lifetime the life of the primary school has changed tremendously and I believe it to be a hugely positive transformation for pupils and teachers alike. 2018/2019 in the life of St. Joseph’s Primary brings further great and exciting change with the arrival of two Junior Infant classes to our school community. It is an historic milestone in St. Joseph’s educational journey that is being greeted with great enthusiasm and anticipation by all here. September will certainly bring a whole new buzz for pupils and teachers! A new era begins for our school and I am delighted to know that the incoming Principal is Ms. Sarah Bradley, who has been a terrific Deputy Principal during my time as Principal and whose support has been invaluable to me. I have every confidence that the school will be in the most capable of hands. Beir bua Ms. Bradley. It is also timely for me now to express my deep gratitude in particular to Sandra our long serving, invaluable secretary whom I know will continue to be a similar support to Ms. Bradley in the practical running of St. Joseph’s C.B.S. in the future. Míle buíochas Sandra. It is with a sense of deep appreciation that I will bid my farewell to St. Joseph’s C.B.S.Primary. G5 have been busy planting potatoes, strawberries, chives, carrots, spinach, lettuce and turnips in class with the Incredible Edibles. Fourth class all got a visit from a “real” Viking. G5 and 4th class got to perform on the Ukulele concert for our parents and grandparents in R9. we have been working hard all year.In science, we made our own “awesome dinky obstacle course” and “flying machines”!! 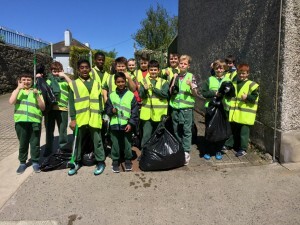 The Green Schools’ Committee have had a very busy last term as they continue to work towards the 6th Green Flag for Global Citizenship Litter and Waste. This was a joint effort by Ali, James R, Joe and Luke W in 5th Class. The poster competition winners are Ralf G5, Caoimhín R7, Vince R8 and David R6. In May, a Tidy Towns clean-up was carried out by the committee around the local area – Hardmans Gardens, Parkview and Magdalene Tower. The committee members also took a trip to the Drogheda Recycling Centre in May. On 18th May, we participated in National WoW (Walk on Wednesday) Day. G6 were the winning class with the most walkers and cyclists. Our Day of Action was held on 14th June when 5th classes hosted a Multicultural Day. All our cultures were celebrated on the day. There were displays and food from Ireland, India, Poland, Nigeria, Spain, Pakistan, Croatia and Trinidad and Tobago. A big thank you to all our parents and families for their great support on the day. Good luck and thank you to our 6th Class members as they move onto secondary school. We will miss you! If you want to fulfill your dreams. Do not be afraid to set the world on fire. Blaze a trail for history. One that begins in youth. You can conquer any goal! The end of another school year has come again and as we finish we are already looking forward to the start of a new one. I would like to take the opportunity to pay tribute to Mr Clayton, who after forty years of loyal and dedicated service to our school and four and a half years of inspiring leadership has decided to take much deserved retirement. On behalf of the staff and of myself we would like to express to you how privileged we feel to have worked under a principal of the calibre of Mr. John Clayton. We know that you and your sons would agree that he treated all those he met with respect, kindness and compassion and that he will be a role model for all of us, especially myself as we prepare for the new school year. We hope that he will not be a stranger to us and will visit us often to make sure we are living up to his example. Next school year will mark the beginning of a historic new chapter in the history of St. Joseph’s. We will welcome two classes of junior infants on the 30th of August. The whole school community has been preparing for this new start for quite some time and we are ready and excited to embark on this challenge. On the 30th of August, I will take over in the role of principal of St. Joseph’s C.B.S and I am deeply honoured to have been appointed to this position. I will lead a staff of professionals who are committed to implementing the elements of the ERST charter in their day to day work here in the school. I hope that I count on your support as parents and guardians as we work together to try and achieve the best possible outcomes for your boys. Until the Autumn, try and encourage reading for enjoyment during the holidays and enjoy the sunshine.